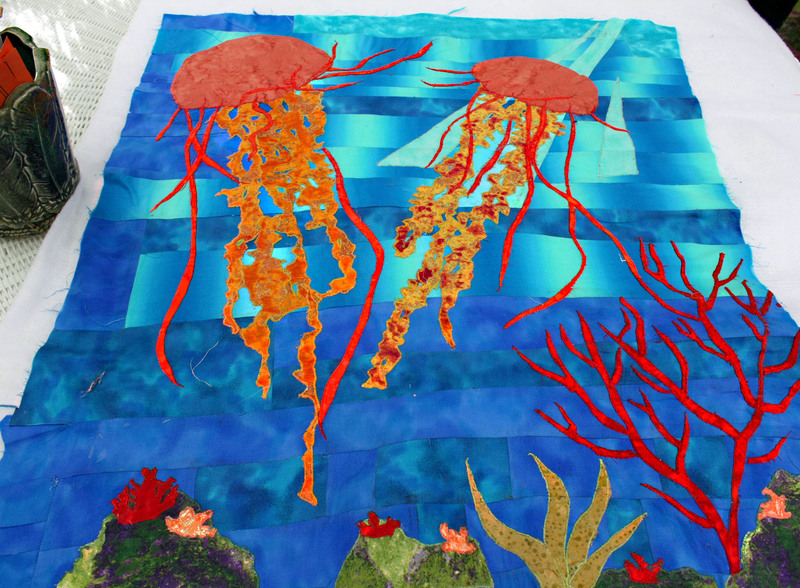 As I mentioned I am including updates on the jelly fish art quilt I’m making, here I’ve appliqued a lot of the ocean floor and jellies. Thread painting will pring it all to life. These are very basic shapes to build on. I wondered many times how to capture light in the water using fabric piecing and this is a pretty good example. I love how the colors are such a strong contrast- so concentrated! The orange looks like it’s felted. Is it just a lot of mottling in the dyeing? I have lately been making an attempt to whip my blog into shape, starting with the layout, categories and moving posts into their proper category. ect. In my attempt, I managed to somehow re post s few older posts accidentally. I’m glad that at least one of my accidental re posts was helpful to someone. 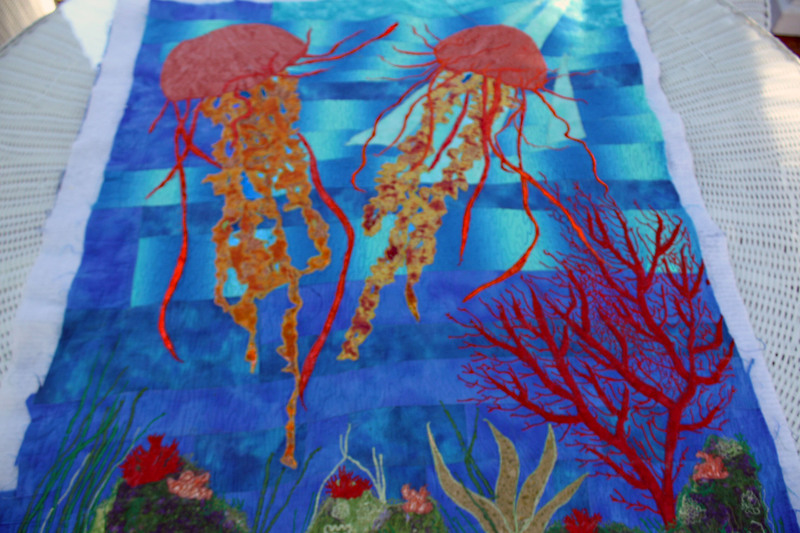 I had one thought that might be helpful, when I did that jellyfish quilt I used a gradient fabric, which gradually changed from blue to white. The line was called “Baby Geniuses” . It was a while ago, so it may not be available. I would guess, though, if you Goggled “gradient fabric” you could find another manufacturer making a gradient fabric like it. Thanks for your comment, You should post a link of the finished quilt here, when you have finished. 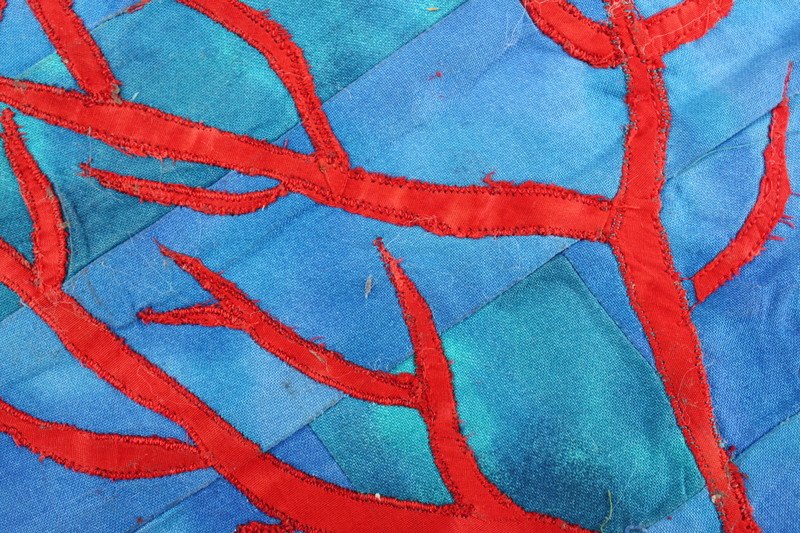 It’s would be interesting to see how another quilter approaches the same sort of theme. All the best to you and happy quilting! 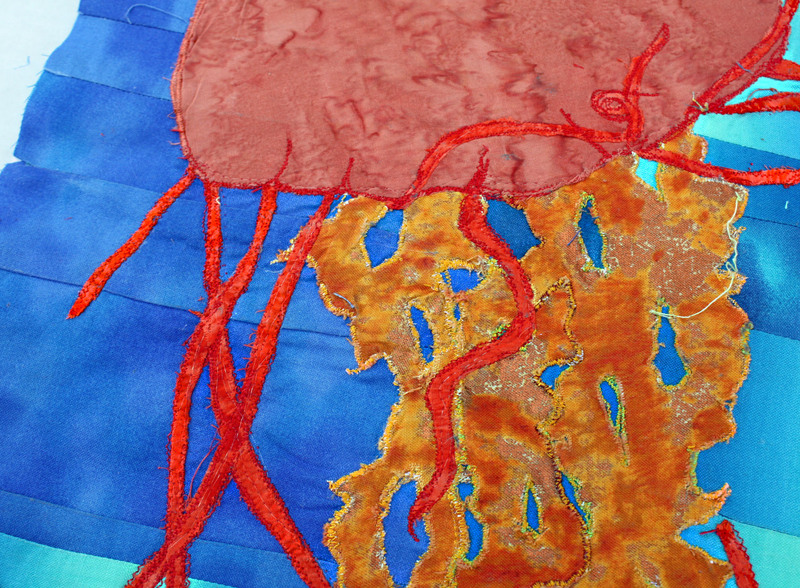 Barbara Z, I realized I left out part of what you asked about.For the jellies, I used an orange batik and fused it to batting and added 1 more layer of fusible(ex. Wonder Under) on top of batting leave the paper on. Draw your Jellyfish head without the tentacles on the paper back. As you draw the jellies head make sure that the bottom edge is curved in a c curve,shorter on the edges and slightly longer in the center. Within that curve make 2 upward waves that are about an 1″ shorter. on each side of the center, space evenly. Cut it out and flip to top fabric side. Mix some permanent fabric paint, like Setacolor by Pebeo, with an orange about the same as your batik color. Divide orange paint into 2 non-food containers. To darken the first it add the tiniest drop of brown or black, mix, and test on a scrap piece of your batik to dry and see true color. To lighten the color in the second container add a tiny touch of white and mix. 1st container add a bit of orange then to darken by adding a tiny tinge touch of black or brown. Mix until it is slightly darker than your batik.Paint a bit to dry on a batik scrape.For 2nd container we want to lighten. Add a tinge of white.Stir. Adjust colors as needed but we want subtle color differences from the batik. Add a slight bit of of water to both containers. You could lightly spritz water on your 2 upward curves. Then paint a line of the darker color in the center of both curves going about halfway up.Then on either side of the dark painted curves a line of the lighter color. lightly paint a small upward line with the darker paint to cause it to recede. Go about 1/2 way up in the 2″upward waves. Now on either side paint a line of the lighter color. Sprite lightly with water to blend a bit.You now should have 2 folds. For the tentacles apply the fusible to the back of your tentacle fabric choice, best is a mottled fabric, like Stonehenge.For mine I used a amazing gold metallic mixed with an orange color by Mark Hordyszynski for Blank Fabrics. After you have fused the back of your tentacles, cut into squiggly shapes. Fuse onto the background the cut squiggled tentacles, fuse to your background fabric then fuse on your jelly heads. heads.